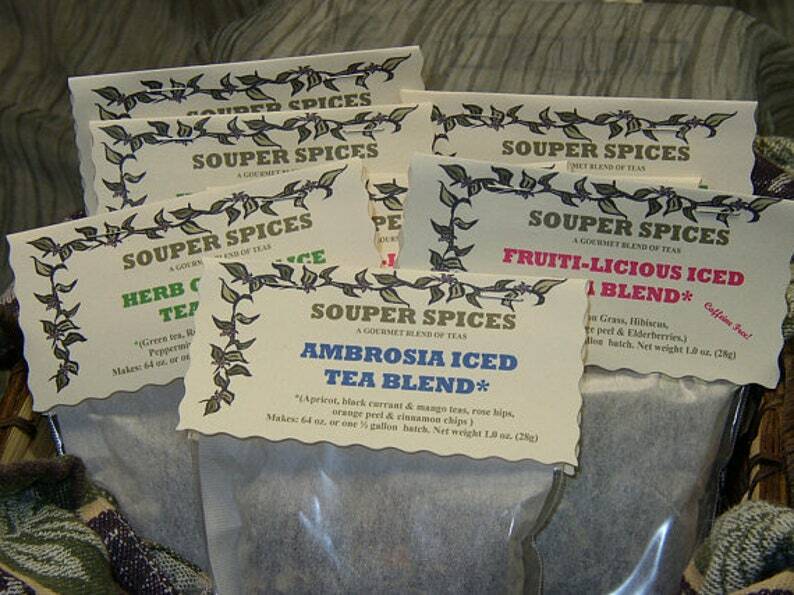 In this gift set, I have put together six (one full ounce tea bags) of my favorite blended iced teas. What a wonderful gift to give to your favorite someone. I always have this on hand for last minute company, family and not to mention for my personal use! Directions are included, but what I like to do, is set my glass tea jug out on the porch and let it steep for a few hours. It seems to be more flavorful steeped by the sun. If you do not care for my choices, go to the page below and make up your own gift box and leave me a note at checkout. This tea is fruity, refreshing, gourmet green iced tea. It's easy to prepare, incased in a large 4x5 teabag, and the results are so satisfying as well as healing. Add sliced oranges, lemon or lime for a tropical touch. Enjoy the benefits of healthy, green tea and try some today! This is the same blend as my hot teas, but incased in a large 4x5 teabag. It's easy to prepare, goes along way and the results are so satisfying. Dessert without the calories. Yummie, yummie. Try some today! Wait until you try this fruity, refreshing gourmet iced tea. This first day I made this, I drank the whole batch in one day! It's easy to prepare, encased in a large 4 x 5 teabag, and the results are so satisfying. Try some today! Wait until you try this fruity, refreshing gourmet iced tea. NO caffeine here. It's easy to prepare, incased in a large 4x5 teabag and the results are so satisfying. Try some today! Ahhh. This tropical tea will send you right to the islands in your mind. Needs no description! Caffeine free! Place tea bag in large 1/2 gallon jug and add 4 cups boiling water. Steep 5 to 8 minutes. Add 4 cups cold water and chill. Pour into glasses, add ice and garnish with a fresh sprig of mint. Try this with fresh fruit such as orange and lemon slices. This is so easy and wonderfully refreshing. Makes one 1/2 gallon. Sit back and enjoy essence of apricot and black tea for a relaxing afternoon delight! This steak rub is delicious! I used it on a roast. Perfect. Arrived quickly. Thanks! Delicious! Makes soup quickly, a good meal or side. Arrived quickly. Thanks! If you are not completly satisfied, I will be happy to exchange or refund your money. Contact me at Barb@souperspices.com before taking any action. I am sure we can work out any problem you may have. During the holidays, please be patient with your order. If it is larger, it takes time to process. I try to get out next day, but sometimes I have to reorder. If you find the shipping too high, email me and I will adjust it for you at the least expensive cost to you. After a recent problem with shipping, I will hold the right to ship in the packaging I choose so there is no damage what so ever. (rain, sleet or snow) I ship the cheapest way I can for you, my customers, so trust that this is the best way. Also international shipping is based on a four pound weight limit (international envelope) Please, if you want it insured you will have to pay, this keeps my cost down. It is not included in the shipping fee.Thank you. I try to have everything on hand, but sometimes I run out of supplies. Therefore, shipping will be delayed until I can stock up, especially with large and special orders.